Excellent! And a big Prosit! Prosit to Ivan for, if I'm not mistaken, has kept up the tradition of getting an award in armour section each time he competes! Doc.... is this your first award at Euro? Taf xi link tal-euro li hemm ir-ritratti? Gordon wrote: Taf xi link tal-euro li hemm ir-ritratti? Is that Gianfranco's middle name? Still alive! I'm building the Staghound at the moment. So this is your first coloured award! prosit! Can you post a pic of the model ? Thank you gentlemen, very honoured to have been part of this small Maltese contingent which fought a very difficult battle this year. The only section that was neglected in figures was mounted, especially scratch. Harold where are you? The AFV section was very well contended in the dios and vignettes reaching over 50 entries between them and all with very high standards and telling different stories. The painting section was less then usual but again the standard was damn high having Golds, Silver and Bronze very close contenders to choose from. Scratch was another well contented section again and dear Alex made a good battle to the Golden boy who has been taking golds for years at Euro. Finally of particular interest, Euromilitaire has a new AWARD in the name of teh late Charles Davis and is dedicated to anything in relation to planes. This yera went to a pilot, so guys I feel BOS is something we dream about but this award we are capable to fight for ... let's think about it! 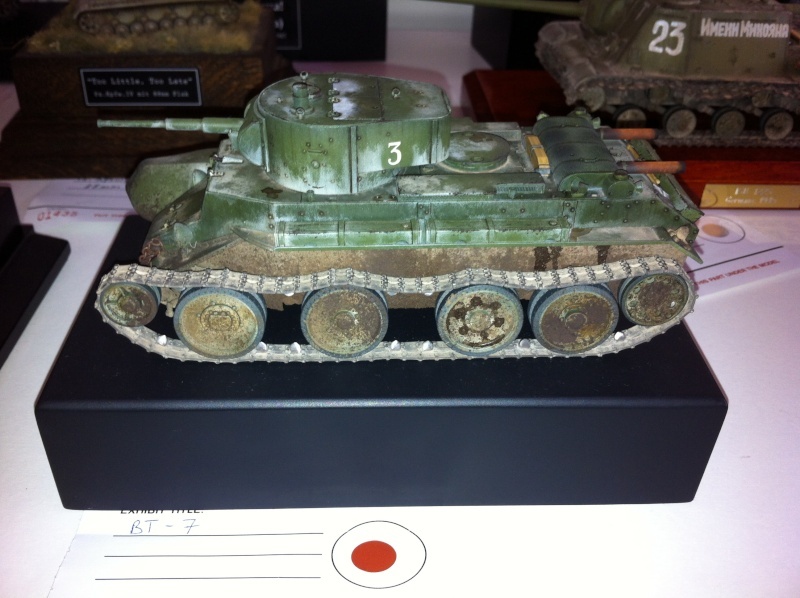 Posted pics of the BT-7 in AFV section...excuse the poor quality! You came a long way, Doc............... Prosit.... looks high standard! I'll go to the AFV and have a look at other pics.